That’s what the little Chestnut-backed Chickadee seemed to say, as it ever-so briefly touched down on a low branch over the pond, directly in front of me. A good reminder to me, now that it’s finally warming up, that I need to pull myself out of the lethargy I’ve been in, and get moving on my own spring to-do list. Let’s see now: weed and prepare the first couple of garden beds; sow broad beans; start broccoli and tomato seeds; sow peas and spinach…. 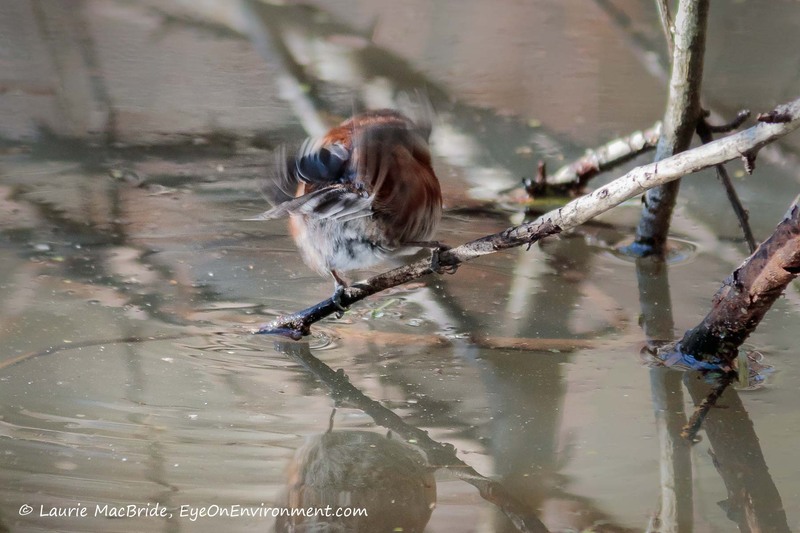 Posted by Laurie MacBride, Eye on Environment on March 15, 2019 in Animals & Wildlife, Birds, Garden and tagged animal behavior, bird watching, food gardening, gardening, movement, nature, photography, ponds, spring, wildlife. A good reminder Laurie. Thanks for the KIA. Hah! Really, I only meant it for a KIA for myself – but if it’s useful, feel free to take it that way, Paul! Yep, it’s coming, slower than molasses in April! But about to speed way, way up!